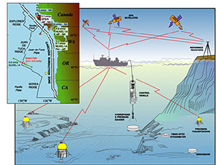 Over the past decade, new technologies have revolutionized how scientists collect information. Yet if the scientists cannot present their findings in a clear way, their efforts are wasted. Technical illustrator Jo Griffith serves as a translator, converting numbers and concepts into graphics and illustrations that are easy to read and interpret. Technology has also changed how she goes about her work. A decade ago, her tools were pen and ink. Now she has the latest computers, graphics software, and printers at her disposal. 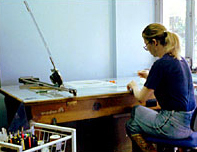 Jo at work sitting at the drafting table. Jo is in great demand at Scripps. Scientists and students on tight deadlines flood her with illustration requests for proposals, journal articles, dissertations, presentations, and web sites. Subjects range from earthquake swarms to whale acoustics to the distribution of penguins in Antarctica. Jo’s job is to convert the data sets they give her into graphs or maps that are clear and accurate. To an untrained eye, many of the graphics she produces resemble a series of squiggly lines. Yet she is also asked to draw sea creatures or research equipment, make seafloor maps, and design the covers of brochures. Recently, she was asked to draw maps showing the distribution of ethnic groups in South America. A particularly memorable project involved drawing a series of Precambrian animals for a book on the history of life. Since nobody has actually seen these creatures, her drawings were based entirely on conversations with scientists and supposition. Jo must work under a lot of constraints. Accuracy is paramount. Creativity and artistic expression must be left for her personal work. Yet her experience as an artist as well as a solid foundation in science is critical to her success. Her ability to visualize the final graphics when the ideas are being presented to her enables her to work quickly. Her sense of color, size, and scale allows her to create graphics that are easy to read and interpret. A successful graphic, she says, can be easily understood by anybody. An example of one of Jo's scientific illustrations. A lot has changed since Jo arrived at Scripps 25 years ago. She drew maps by hand. She made transparencies by cutting out colored acetates. Today, she produces virtually everything from graphs to sketches electronically. Data arrives in digital files. Software programs convert these files into graphs, charts, or maps. Fancy printers can spit out anything from slides to posters. Tasks that used to take weeks now can be completed in hours. For Jo, the transition from pen to computers started about seven years ago. As a self-described “analog peg in a digital hole,” it wasn’t easy. She now enjoys working on computers, but her struggles to keep pace with the evolving technology continue. No sooner does she master one program and its bugs than a new one come out. These programs are wonderful, but they also must be learned, so Jo spends a lot of time in the classroom learning about new software. Read an interview with Jo. Get more info on Jo's background. See images of Jo at work. See Jo's typical work week. Other sites related to Jo's career.